Artists draw a lot of lines. Lines are stories. Lines travel. And if its true what they say that happiness lies not in the destination but in the journey then lines might just be happiness. Lines can connect. Lines also delineate. They can close in on themselves to suggest shapes. They can form borders. Inside/Outside. This/That. Here/There. But if you leave the line open around a shape then inside gets out, outside comes in. If you turn the border between shapes ninety degrees then the slash becomes the hyphen; This-That (this is that), Here-There (here is there). Lines can be regimental. Everybody line up. Fall in line. The line shows us the norm. And that’s all you’ve got until you learn to draw your own. If you can draw you’re own line then you are an artist, whether itâ€™s a piece of art you make or a piece of your own life. Well you’ve got to draw the line somewhere, right? Seems almost arbitrary. Might as well be here, I guess. Like you should have drawn it earlier but now you’ve let it go and you’d better draw it now before things really get out of hand. Like you’ve got no choice but to draw the line. Why can’t you just NOT draw the line? Not an option I guess. The artist in me just has to draw his own line. The line describes me, leads me, becomes me. I draw it, or it draws itself, depending on my view of the event at any particular moment. Life has a way of becoming fragmented and diffuse but when that happens it helps to start drawing lines between things. Sometimes those lines need to delineate, make shapes, create borders, add clarity. Sometimes those lines make connections, suggest relationship, show us the unity of the parts. All in how you draw the line. We are just now emerging form a delicate form of disaster known as an ice storm. More specifically, “The Great Ice Storm of 2009”. The storm lined up horizontally and ran through us sideways, owning this part of Kentucky for almost three days. The snow stayed north and the rain stayed south. We were caught between in a limbo-land of ice. The first wave laid down a delicate coat of the most beautiful crystalline wonder. What came next was the disaster. My job at the local home improvement warehouse provided many points of reference for the depth of the disaster. The day before the storm hit, my neighbor Kent was in Lowe’s searching for supplies to survive the coming storm. It was my first hint that something nasty was on the way since this long-time Paducah resident was scooping up propane canisters and hardware to make ready his space heater, seeing what was about to happen much clearer than I. On my way out to my car after work the first wave of weather was hitting and the parking lot and cars were being freshly coated. The ice was falling heavily and made a sound like hot spitting grease on the pavement. I jammed my key in the frozen lock but it wouldn’t turn. I then bent it in a fit of stupid urgency, trying to escape the sizzling ice. I was extremely grateful that the back hatch opened for me but the bent key no longer found a way to function in the ignition slot. I must have jacked it up good because even my wife’s proper key didn’t work the next day. The car would eventually sit in the car repair lot encased in a jacket of ice for more than a week during the entire duration of this “event.” My sweet angel coworker Dana gave me a lift home that night. The next day we still had power although it had gone out for a few hours overnight. I was able to borrow our neighbor’s car to get to work and got there about an hour late. There was a brief pause in the onslaught of ice accumulation during this time and my ride to work opened up a silvery frozen world encased in a half an inch of ice. This middle period of the storm was warmer and more rain fell here in Paducah than accumulated as ice. What was to come was very bad but much worse would have resulted if it was just five or ten degrees colder during this time. We had only six or seven employees on duty that day and we mostly had bad news for the shoppers who straggled in. The kerosene heaters and generators had already been scooped up by prescient folks like my neighbor Kent. I was able to find about eight more chain saws in top stock and brought them down where they disappeared in about an hour. People were out mainly to find heaters as the power was slowly being knocked in the area and people knew worse was to come. The lawn and garden section of the store was the hot spot that day where the cabinet specialist and I filled in for absent employees. We could only repeat the mantra “No, we sold out of space heaters yesterday… no generators either” to the hopeful faces. The weather turned colder that evening. All day we watched the radar as the long thin storm drove itself through the heartland. Reports of disaster came in from Arkansas and we knew we were soon in for the same ourselves. That night was the night of breaking trees. I heard many stories later from people in more heavily wooded areas about the night-long series of gunshot sounds as the the trees and utility poles succumbed. By morning our power was out and the world outside was frightening and strangely beautiful. Trees were snapped off or bowed to the ground with ice. Power lines sagged ominously. I drove to work once again in the borrowed car and slipped under the drooping power lines with a prayer for a few moment’s additional reprieve. At work the sense of crisis was palpable. Requests for generators, heaters, chain saws were routinely denied. Our normal delivery truck arrived somehow but it contained a heartbreaking assortment of patio furniture, bar-b-cues and whatnot, nothing of any use. A crowd assembled back by the delivery bay and the work crew labored to clear out the truck, searching for anything of value to deal with your average winter ice storm disaster. One single generator emerged at the end and our Sales Manager deftly appropriated the proper recipient by saying, rather than “Who was first in line”, “YOU were first in line, weren’t you?.” Fortunately there was no challenge to that assertion. We had an emergency truck arriving later full of generators and people lingered in the store waiting for it. This was most amazing to me since everyone there knew that they and their loved ones were clinging to the prospect of obtaining this device for their comfort and existence, yet there was very little general ruckus. People just seemed to be commiserating with each other in the crisis. The Store Manager sent everyone out before noon with the news that the truck wouldn’t arrive until at least 4 p.m.. So much needed to be done anyway. The lines at gas stations went on for half a mile. Kerosene for some reason was impossible to find. All the peripheral items necessary for the primary things like heaters, generators and chain saws were already sucked out of the store; kerosene, regulators, hoses, plugs, chain saw oil and replacement blades. In fact, the story of the next few days would be finding the vital components that would complete the device. I learned more about four pronged locking plugs for generators in the next few days than I ever knew. The generator truck would eventually arrive around midnight and Lowe’s stayed open until the last one was sold. Powerfully sad stories emerged as well. In quiet dignity, a man would ask first for kerosene heaters (“sold out”), propane canisters (“gone two days ago”) or anything to heat a house. Then I’d hear his story, how he’d driven a hundred miles to look after his eighty year old parents and was just trying to find something to keep them warm for a few days. I heard nine or ten stories just like this that day. The worst was a phone call from man at a hospital desperate to find kerosene; “This is awful! How could we not be ready for this. What will we do? Do you know anywhere I can get kerosene? ?” I didn’t. The ice storm was passing and a deep cold was settling in. Like a frog in frozen mud, like a carp in winter, we were living in ice limbo. People were disconnected from their normal lives and the world in general seemed to be receding. The sense of disconnect was strongest for me when I eagerly turned to the national news after our power was restored to find no mention of the disaster for three consecutive days (days 4, 5 and 6). Hearing the news directly through people’s individual stories told me that whole counties were out of power with entire rows of utility poles were knocked down in massive scale. On day seven the national anchor mentioned us again noting that there were still half a million without power. Our power came back on only a day and a half after we lost it. We tried to offer our guest room to the people crowded into the house across the street. She was overwhelmed with members of her extended family who had sought refuge there but declined our offer saying “You don’t want them over there because they stay up all night.” I offered our hot showers and guest room to several people at worked but no one took me up on it. I confessed my guilt about getting power back so quickly to my co-workers and one said “I pay 2,500 bucks a year in property tax, I don’t feel guilty.” Cold but true. After about a week the temperatures rose and the ice showered out of the shattered trees. The emergency trucks arrived full of heaters, chain saws and generators (still woefully short of vital parts for them however as that four-prong locking plug became the hottest ticket in town). The utility trucks began to arrive from around the country and I began to note the license plates every morning as I drove past dozens of them near Jackson Power; Indiana, Michigan, Minnesota, North Carolina. Good people were in town to help us. I never knew how lovely an electrical utility truck is. Thirty of them lined up with their engines running is absolutely gorgeous. The crisis eased but it would take weeks for some people to get their power back and some still do not have it as I speak (almost three weeks out). I have a deep affection for trees. They’ve always seemed to represent our greatest aspirations as they reach their limbs toward the sky. Now their role in connecting us to the heavens had taken a beating. As Stefanie and I drove out to a local wildlife area yesterday we saw trees everywhere with their top limbs turned down like shirt collars, or sheared off which exposed a strange pattern of white pith across the woods. The immense quantity of wood on the ground was gradually being formed into piles by the sturdy survivors of this cruel episode of weather. The trees will remain ugly at least until spring softens them a bit with green. We should soon have beautiful sunsets because the piles of wood will be burning into summer. Here’s the deal. Stefanie and I shared the Cowango Blog for several years and it functioned well as a forum for us to discuss our travel experiences and talk about some of the ins and outs of setting up homes in San Miguel de Allende, Mexico and Paducah, Kentucky. Ever sinceÂ we completed the two house-building projects in early 2007 and stowed away our travel boots the energy placed into the Cowango Blog has taken a hit . Â We’ll still be posting there occasionally, for the next year or so at least, but it’s time to move on. Stefanie and I are still very much in love and I am moreÂ intenselyÂ married to her now than ever before but this connubial blog thing had to go. Yes, we are now going through a blog divorce. Fortunately, there are no children. When I explore the connection between these ideas I start to discover a motive for what I do when I’m working at art. A dynamic description comes out that is less “either-or” and more “both-and” (hmm… seems even trying to describe it requires hyphens). I find art and the art-making process incredibly hard to talk about because the descriptive categories we employ often seem so leaden and unfit. Yet I am driven to try anyway. Life in the Hyphen will be this attempt. That little dash will be my thread. 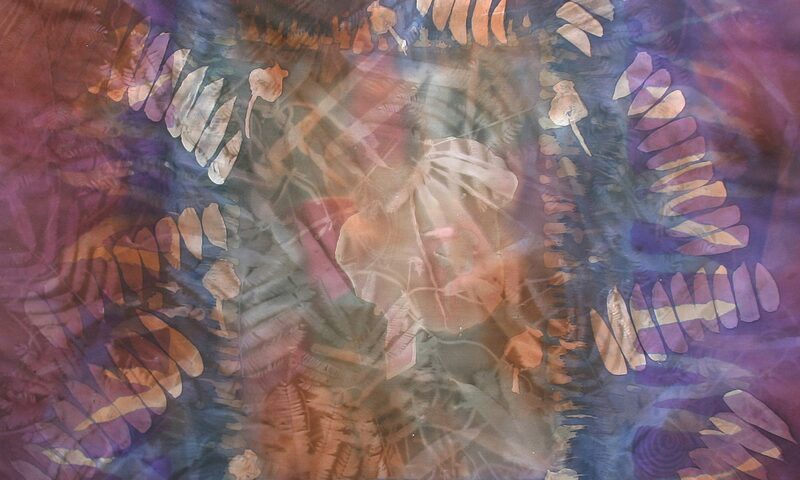 David Lucht is a batik artist living in Paducah, Kentucky. You’ll find small swatches of his mental fabric here which you are welcome to examine. Each thread in them was found somewhere between two worlds. Let other’s know about this blog! So Forth and So On A blog from my neighbor and fellow wordsmith William Renzulli.